Countdown timers use animated .gif files that calculate the remaining time on the clock. Each time the email is opened the image refreshes with the updated information - creating an authentic sense of urgency. Email timers are compatible with most modern email clients and we support mobile email embedding. Different email software handles these images differently, if you are interested to see how each email client handles animated gif's we have an overview page. "We use a Global Content Delivery Network (CDN) to serve your timers. This ensures the fastest possible rendering for a seamless integration into your emails." 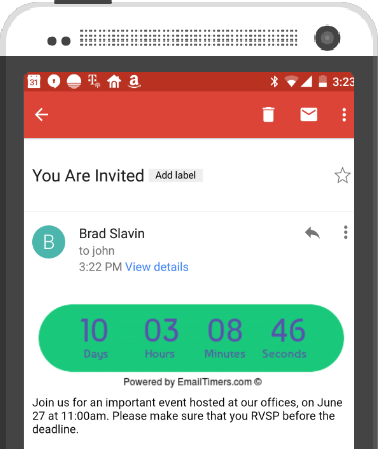 Each and every person who opens their email will be shown a custom email timer. Our highly optimized CDN ensure the fastest throughput to deliver a hassle free integration with your email software. "Select a timer style that is appropriate for your audience. You can easily customize the colors for maximum impact. " "Creating a sense of urgency in your emails is one of the most effective ways to increase your click through rates"
At the end of the day your emails should be selling the click and not the content. Your ultimate goal should be to drive engagement and email countdown timers are an excellent way to create urgency, and to drive up user engagement. Breakthrough the clutter with sophisticated email timers that create a sense of urgency in your email messages. Compatible with most email systems, these timers are easy to use yet powerful and engaging. Looks great across all devices. Excellent compatibility across email clients for high impact messages. With a highly optimized CDN your countdown timers will load instantly in your customers email client. Track your campaign with real time impression analytics. Track each time your message is opened, forwarded or reviewed. Create an unlimited number of timers in your account, each with it's own custom tracking and customizations. Choose your timer style, change the colors, swap out images. You can do it all! "We have a weekly newsletter for sales people called the Monday Morning Sales Coach. We use countdown timers in our emails when we run promotions and special offers for our online sales training program." 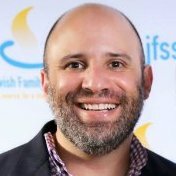 "I run a marketing agency and use email countdown timers in client campaigns to improve CTR's in emails." "We use email timers in our monthly newsletter and promotions. We often run time sensitive campaigns and these email timers not only look great - but they also improve our response rates. "